One of our managers had a resident who has some troubles and found out that painting was therapy for her, a way to escape from her pain and express herself. The manager asked her if she would teach a painting class for other residents. The Foundation provided the art supplies to conduct the class. The day of the class came with 9 in attendance, 6 painted and 3 watched. 2 of the residents in attendance had never participated in any community activities. The class lasted for over 2 ½ hours, there was talking, laughing, smiling, learning, and new relationships developed. Usually after an activity or event, everyone just leaves and doesn’t help to clean up. Everyone stayed and cleaned up after the class. 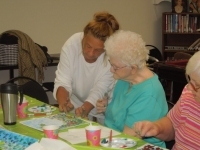 This activity sponsored by loving donations brought a resident out of her shell, brought 2 residents out of their apartments who normally do not participate and a sense of pride to many others. This is the type of life transformation your contributions encourage!